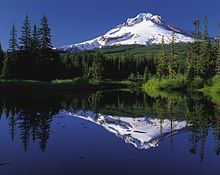 Mount Hood reflected in Mirror Lake water. A mirror image (in a plane mirror) is a reflected duplication of an object that appears almost identical, but is reversed in the direction perpendicular to the mirror surface. As an optical effect it results from reflection off of substances such as a mirror or water. It is also a concept in geometry and can be used as a conceptualization process for 3-D structures. Two-dimensional mirror images can be seen in the reflections of mirrors or other reflecting surfaces, or on a printed surface seen inside-out. If we look at an object that is effectively two-dimensional (such as writing) and then turn it towards a mirror, the object turns through an angle of 180º and we see a left-right reversal in the mirror. In this example, it is the change in orientation rather than the mirror itself that causes the observed reversal. Another example is when we stand with our backs to the mirror and face an object that's in front of the mirror. Then we compare the object with its reflection by turning ourselves 180º, towards the mirror. Again we perceive a left-right reversal due to a change in orientation. So, in these examples the mirror does not actually cause the observed reversals. The concept of reflection can be extended to three-dimensional objects, including the inside parts, even if they are not transparent. The term then relates to structural as well as visual aspects. A three-dimensional object is reversed in the direction perpendicular to the mirror surface. In physics, mirror images are investigated in the subject called geometrical optics. In chemistry, two versions (isomers) of a molecule, one a "mirror image" of the other, are called enantiomers if they are not "superposable" (the correct technical term, though the term "superimposable" is also used) on each other. That is an example of chirality (chemistry). In general, an object and its mirror image are called enantiomorphs. If a point of an object has coordinates (x, y, z) then the image of this point (as reflected by a mirror in the y, z plane) has coordinates (-x, y, z). Thus reflection is a reversal of the coordinate axis perpendicular (normal) to the mirror's surface. Although a plane mirror reverses an object only in the direction normal to the mirror surface, there is usually a perception of a left-right reversal. Hence, the reversal is called "lateral inversion". The perception of a left-right reversal is probably because the left and right of an object are defined by its perceived top and front, but there is still some debate about the explanation amongst psychologists.The psychology of the perceived left-right reversal is discussed in "Much ado about mirrors" by Professor Michael Corballis (see "external links", below). Reflection in a mirror does result in a change in chirality, more specifically from a right-handed to a left-handed coordinate system (or vice versa). As a consequence, if one looks in a mirror and lets two axes (up-down and front-back) coincide with those in the mirror, then this gives a reversal of the third axis (left-right). If a person stands side-on to a mirror, left and right will be reversed directly by the mirror, because the person's left-right axis is then normal to the mirror plane. 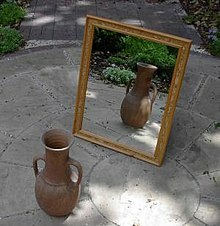 However, it's important to understand that there are always only two enantiomorphs, the object and its image.Therefore, no matter how the object is oriented towards the mirror, all the resulting images are fundamentally identical (as Professor Corballis explains in his paper "Much ado about mirrors", mentioned above). In the picture of the mountain reflected in the lake (photograph top right), the reversal normal to the reflecting surface is obvious. Notice that there is no obvious front-back or left-right of the mountain. In the example of the urn and mirror (photograph to right), the urn is fairly symmetrical front-back (and left-right).Thus, no obvious reversal of any sort can be seen in the mirror image of the urn. A mirror image appears more obviously three-dimensional if the observer moves, or if the image is viewed using binocular vision. This is because the relative position of objects changes as the observer's perspective changes, or is differently viewed with each eye. A mirror does not just produce an image of what would be there without it; it also changes the light distribution in the halfspace in front of and behind the mirror. A mirror hanging on the wall makes the room brighter because additional light sources appear in the mirror image. However, the appearance of additional light does not violate the conservation of energy principle, because some light no longer reaches behind the mirror, as the mirror simply re-directs the light energy. In terms of the light distribution, the virtual mirror image has the same appearance and the same effect as a real, symmetrically arranged half-space behind a window (instead of the mirror). Shadows may extend from the mirror into the halfspace before it, and vice versa. In mirror writing a text is deliberately displayed in mirror image, in order to be read through a mirror. For example, emergency vehicles such as ambulances or fire engines use mirror images in order to be read from a driver's rear-view mirror. Some movie theaters also take advantage of mirror writing in a Rear Window Captioning System used to assist individuals with hearing impairments watching the film. It is also possible to create a non-reversing mirror by placing two first surface mirrors at 90º to give an image which is not reversed. Wikimedia Commons has media related to Symmetric images. ^ Adams, Cecil (1985-09-27). "Are dogs unable to see 2-D images (mirrors, photos, TV)?". The Straight Dope. Retrieved 2008-01-31.